Frequently, customers ask us over the phone what it would cost to clean their windows, pressure clean the driveway, tackle the boat, clean the gutters or do the skylights. Two jobs are never the same, and it depends on a wide variety of factors such as access (around the building, height, reach and more), the amount of accumulated dirt (are we talking 5 years or 30 years), size, length and much more. That's why rather than giving you a ballpark estimate, we'd rather invest our time to visit the premises so we get the quote right the first time, and you know exactly what it will cost, with no surprises. It's obligation-free, and rest assured, we're extremely competitive. 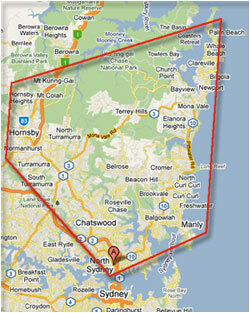 Our service area is indicated on the map to the right.